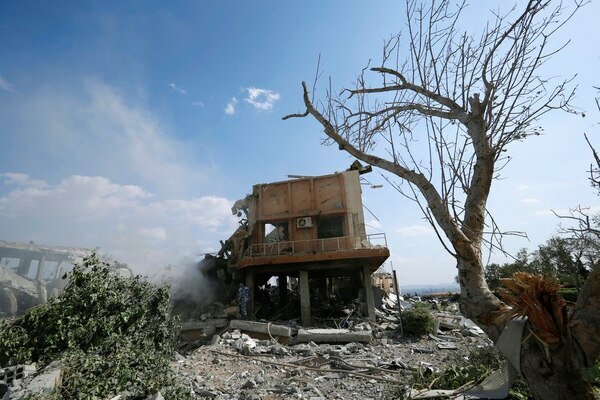 BEIRUT — The Western airstrikes targeting suspected Syrian chemical weapons facilities might have rained down punishment from the sky, but they will not fundamentally degrade a war machine whose main bases, weaponry and personnel remain in place. Any opposition expectations that the airstrikes might try to destroy or degrade Assad’s lethal air power or target bases where his warplanes and helicopters begin their bombing missions were quickly dashed: The U.S., British and French precision attacks only singled out Assad’s alleged chemical weapons capabilities. “If this is it, Assad should be relieved,” Randa Slim, an expert with the Washington-based Middle East Institute, wrote on Twitter. More pertinently, the Syrian army declared the battered town of Douma “fully liberated” after the last group of rebels left. Douma was the site of the suspected April 7 chemical weapons attack and also the last rebel-held town in the eastern Ghouta region that was once a sprawling rebel-held bastion at the doors of the capital. Thousands of hard-line rebels capitulated in Douma following years of siege and an air and ground campaign that killed hundreds in recent weeks. The recapture of Douma effectively ends a nearly seven-year rebellion near Damascus and marks Assad’s most significant victory since his forces retook the northern city of Aleppo in late 2016. With seemingly open-ended support from allies Russia and Iran, the Syrian military will most definitely turn its attention to remaining opposition-held territory, namely in the south and the northern province of Idlib. The seemingly limited airstrikes came as a disappointment to Syria’s opposition, with one rebel spokesman labeling them a “farce.” Another senior opposition figure, Nasr Hariri, said the attacks were welcome but only reinforced the message that while it is not OK to use chemical weapons, the government can continue to “use explosive barrels and cluster bombs” with impunity. Assad’s chemical weapons capabilities — and exactly what was hit Saturday — remain shrouded in mystery. Despite Syria’s commitment to abolish its program in 2013, U.S. officials say it is “highly likely” that Assad kept a hidden, undisclosed stockpile. They say information gathered from recent alleged attacks also suggest Assad retained a “continued production capacity” — also banned under the 2013 deal. The Pentagon said Saturday that it believes the airstrikes “attacked the heart of the Syrian chemical weapons program,” significantly degrading Syria’s ability to use such weapons again. Russian officials said the damage was minimal, maintaining that all key air bases were intact and the purported chemical weapons facilities had been abandoned long ago. Capt. 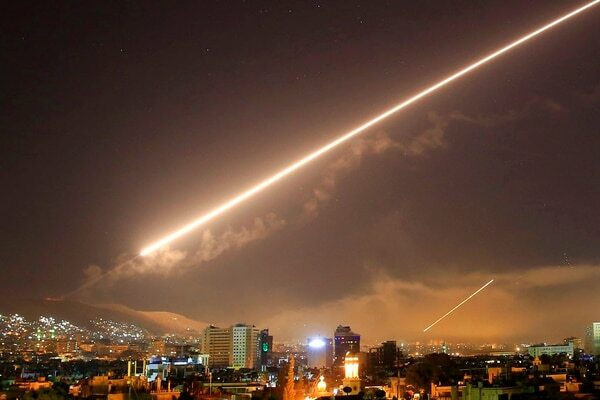 Adulsalam Abdulrazek, a former officer in Syria’s chemical program, said the overnight strikes probably hit “parts of, but not the heart” of the operation. Speaking to The Associated Press from rebel-held northern Syria, he said they were unlikely to curb the government’s ability to produce such weapons or launch new attacks. He said there were an estimated 50 warehouses storing chemical weapons before the program was dismantled in 2013. He said he believes those fixed storage facilities, mostly in rural areas, are intact or only slightly dispersed, and that the program was only partly dismantled because Damascus didn’t allow inspections. IHS Jane’s expert Karl Dewey, said the scientific research facility on the northeastern edge of Damascus is thought to have integrated chemical payloads onto artillery. It is one of at least three sites that have been consistently referenced in association with Syria’s chemical weapons program, including Masyaf and Dummar, also known as Jamraya, both reported to have been hit by Israeli strikes last year. Whatever the rationale for using chemical weapons, even Assad’s most persistent detractors agree he does not need them at this point in the war. “Will this deter Assad from using chemical weapons again? Possibly, not least because he’s essentially won the war anyway,” wrote Faysal Itani, resident senior fellow in the Atlantic Council’s Rafik Hariri Center for the Middle East.